Expression of the preproglucagon gene. A, Diagram of the proglucagon gene and encoded mRNA. B, Alternative posttranslational processing of proglucagon in pancreas, intestine, and brain. Kieffer et al. Endocr Rev. 1999 Dec;20(6):876-913. Structure of proglucagon and biological actions of GLP-1 and GLP-2. The principal target cell types for GLP-1 (islet ß cells stained with insulin antiserum) and GLP-2 (intestinal endocrine cells stained with GLP-2 receptor antiserum) are shown below the peptide sequences. The biological actions of the peptides are summarized below. GRPP, Glicentin-related pancreatic polypeptide; IP, intervening peptide; GLP-2R, glucagon-like peptide-2 receptor. Drucker DJ. Endocrinology. 2001 Feb;142(2):521-7. 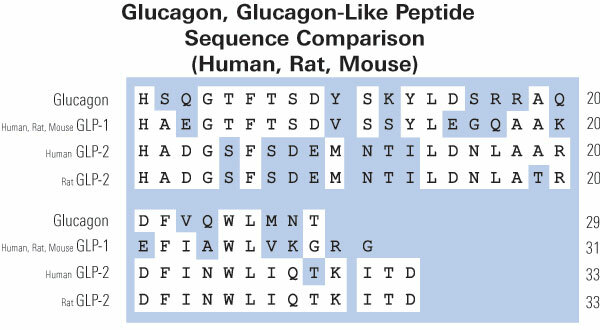 Glucagon-like peptide-1 (GLP-1) is derived from the transcription product of the proglucagon gene. 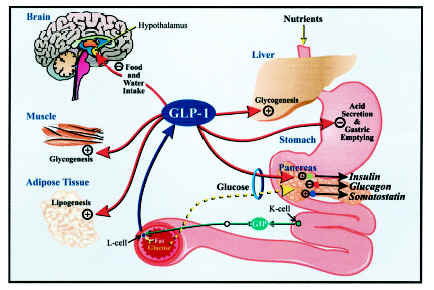 The major source of GLP-1 in the body is the intestinal L cell that secretes GLP-1 as a gut hormone. The biologically active forms of GLP-1 are: GLP-1-(7-37) and GLP-1-(7-36)NH2. Those peptides result from selective cleavage of the proglucagon molecule. Structure of Mammalian Proglucagon and Tissue-Specific Processing of Proglucagon into the PGDPs. The numbers above and below the proglucagon sequence refer to specific amino acid residues within proglucagon. IP, Intervening peptide. Drucker. Mol Endocrinol. 2003 Feb;17(2):161-71. Structure of mammalian proglucagon, proglucagon-derived peptides, and biological actions of GLP-2. Structure of mammalian proglucagon, the proglucagon-derived peptides, and the biological actions of GLP-2. The numbers above and below the proglucagon molecule correspond to the positions and length of specific PGDPs. MPGF, Major proglucagon fragment; IP, intervening peptide. Modern societies have moved from famine to feast and obesity and its co-morbidities now sweep the world as a global epidemic. Numerous scientific laboratories and pharmaceutical companies have taken the challenge and are now exploiting novel molecular targets for treatment of obesity. The pre-proglucagon system constitutes interesting candidates as potential targets for new anti-obesity drugs. In the periphery, pre-proglucagon derived peptides, Glucagon-Like Peptide-1 (GLP-1), Glucagon-Like Peptide-2 (GLP-2) and oxyntomodulin (OXM) are involved in a wide variety of physiological functions, including glucose homeostasis, gastric emptying, intestinal growth, insulin secretion as well as the regulation of food intake. Peripheral administration of GLP-1 derivatives and analogues to both rodents and man have shown promising effects on food intake and body weight suggesting that such therapies constitute potential anti-obesity treatment. In the central nervous system, pre-proglucagon and hence GLP-1, GLP-2 and OXM are exclusively found in a small population of nerve cells in the nucleus of the solitary tract. These constitute a neural pathway linking the "viscero-sensory" brainstem to hypothalamic nuclei involved in energy homeostasis. Intracerebroventricular administration of all of the three derived peptides robustly decrease food intake. It is evident that central GLP-1 agonism probably in combination with GLP-2 and/or OXM agonism constitute a potential pharmacological tool to reduce food intake and maybe also enhance energy expenditure. This and other aspects of the current state of the role of central pre-proglucagon in energy homeostasis are reviewed. Larsen et al. Curr Pharm Des. 2003;9(17):1373-82. Glucagon-like peptide-1 (GLP-1) (7–36) amide is a glucoregulatory hormone with insulinotropic and insulinomimetic actions. We determined whether the insulinomimetic effects of GLP-1 are mediated through its principal metabolite, GLP-1 (9–36) amide (GLP-1m). Glucose turnover during two, 2-h, euglycemic clamps was measured in 12 lean and 12 obese (BMI <25 or >30 kg/m2) male and female subject volunteers with normal oral glucose tolerance test. Saline or GLP-1m were infused from 0 to 60 min in each study. Additionally, seven lean and six obese subjects underwent a third clamp in which the GLP-1 receptor (GLP-1R) antagonist, exendin (9–39) amide was infused from -60 to 60 min with GLP-1m from 0 to 60 min. No glucose infusion was required in lean subjects to sustain euglycemia (glucose clamp) during saline or GLP-1m infusions. However, in obese subjects glucose infusion was necessary during GLP-1m infusion alone in order to compensate for a marked (>50%) inhibition of hepatic glucose production (HGP). Plasma insulin levels remained constant in lean subjects but rose significantly in obese subjects after termination of the peptide infusions. During GLP-1R blockade, infusion of glucose was immediately required upon starting GLP-1m infusions in all subjects due to a more dramatic reduction in HGP, as well as a delayed and modest insulinotropic response. We conclude that GLP-1m potently inhibits HGP and is a weak insulinotropic agent. These properties are particularly apparent and pronounced in obese but only become apparent in lean subjects during GLP-1 (7–36) receptor blockade. These previously unrecognized antidiabetogenic actions of GLP-1m may have therapeutic usefulness. Elahi et al.Obesity (Silver Spring). 2008 Jul;16(7):1501-9. Proliferative and Antiapoptotic Effects of GLP-1 and GLP-2 in the Pancreas and Intestine, Respectively. GLP-1 stimulates cell proliferation in pancreatic ductal cells and islets, and exerts antiapoptotic actions on islet ß-cells and neurons. GLP-2 stimulates intestinal crypt cell proliferation and inhibits apoptosis in the crypt and enterocyte compartments of the gut epithelium. GLP-2 Actions in the Gastrointestinal Mucosal Epithelium. The actions of GLP-2 are predominantly indirect and mediated by activation of GLP-2Rs in enteroendocrine cells or enteric neurons. Tang-Christensen et al. Nat Med. 2000 Jul;6(7):802-7. Comparison of the effects of ICV and iPVN proglucagonderived and related products on food intake in fasted rats. A, Cumulative food intake (grams) up to 8 h after ICV injection of GLP-1, OXM, glucagon, or glicentin (all 3 nmol) into fasted animals. *, P < 0.05 vs. saline control, B, Cumulative food intake (grams) up to 24 h after an acute iPVN injection of GLP-1, OXM (both 1 nmol), or exendin-4 (0.03 nmol) into fasted animals. *, P < 0.01 vs. saline control for all groups at 1, 2, and 4 h. *, P < 0.05 vs. saline control for exendin-4 only at 8 h.
Dakin et al. Endocrinology. 2001 Oct;142(10):4244-50. Effects of ICV and iPVN OXM on food intake in fasted rats. A, Cumulative food intake (grams) up to 8 h after an acute ICV injection of OXM (0.3, 1, 3, or 10 nmol). B, Cumulative food intake (grams) up to 8 h after an acute iPVN injection of OXM (0.1, 0.3, or 1.0 nmol) into fasted animals. *, P < 0.05 vs. saline control. Inhibition of OXM and GLP-1 effects on food intake by exendin-(9–39). A, Food intake 1 h after an acute ICV injection of GLP-1 (3 nmol), GLP-1 plus exendin-(9–39) (30 nmol), OXM (3 nmol), OXM and exendin- (9–39) (30 nmol), or exendin- (9–39) alone (30 nmol). B, Food intake after an acute iPVN injection of GLP-1 (1 nmol), GLP-1 and exendin-(9–39) (10 nmol), OXM (1 nmol), OXM and exendin-(9–39) (10 nmol), or exendin-(9–39) alone (10 nmol) into fasted animals. **, P < 0.005 vs. saline control. Effect of ICV OXM at the onset of the dark phase. Effect of ICV OXM at the onset of the dark phase. Sated rats received an ICV injection of OXM, GLP-1 (3 nmol), or saline at the onset of the dark phase. Food intake (grams; A) and behaviors (B) at 1 h postinjection were determined. *, P < 0.05 vs. saline control. Competition of [125I]GLP-1 binding in rat hypothalamic membranes by GLP-1 and OXM. Rat pancreatic and intestinal sections with an antiserum for human GLP-1 (7–37) (Phoenix Pharmaceuticals, Mountain View, California, USA) at a concentration of 1/500. The second antibody was a biotinylated goat anti-rabbit immunoglobulin, and the signal was detected using the Vectastain ABC kit (Vector Laboratories, Burlingame, California, USA) with DAB as a substrate. The section was counterstained with methyl green. Nie et al. J Clin Invest. 2000 Apr;105(7):955-65. Granata et al. Obestatin promotes survival of pancreatic beta-cells and human islets and induces expression of genes involved in the regulation of beta-cell mass and function. Santoro et al. Enterohormonal changes after digestive adaptation: five-year results of a surgical proposal to treat obesity and associated diseases. Pacheco et al. The effects of duodenal-jejunal exclusion on hormonal regulation of glucose metabolism in Goto-Kakizaki rats. Am J Surg. 2007 Aug;194(2):221-4. Bradford et al. Dietary unsaturated fatty acids increase plasma glucagon-like peptide-1 and cholecystokinin and may decrease premeal ghrelin in lactating dairy cows. J Dairy Sci. 2008 Apr;91(4):1443-50. Liu et al. Prolonged remission of diabetes by regeneration of beta cells in diabetic mice treated with recombinant adenoviral vector expressing glucagon-like peptide-1. Molecular Therapy. 2007; 15: 86-93. Proto et al. Plasma levels of neuropeptides in Alzheimer's disease. Sztefko et al. Effect of hormone therapy on the enteroinsular axis.